Joan Biskupic, a CNN legal analyst who has covered the U.S. Supreme Court for 25 years and has authored several biographies of Supreme Court justices, offered a recent lecture at Trinity College called, “Covering and Uncovering the Roberts Supreme Court,” detailing her experience as a political journalist, analyst, and author. Biskupic was honored as the recipient of the college’s 2018 Moses Berkman Memorial Journalism Award, which recognizes the careers of outstanding journalists. Professor of Religion in Public Life Mark Silk, director of the Leonard Greenberg Center for the Study of Religion in Public Life at Trinity, presented the award to Biskupic in Mather Hall’s Terrace Rooms on November 15. 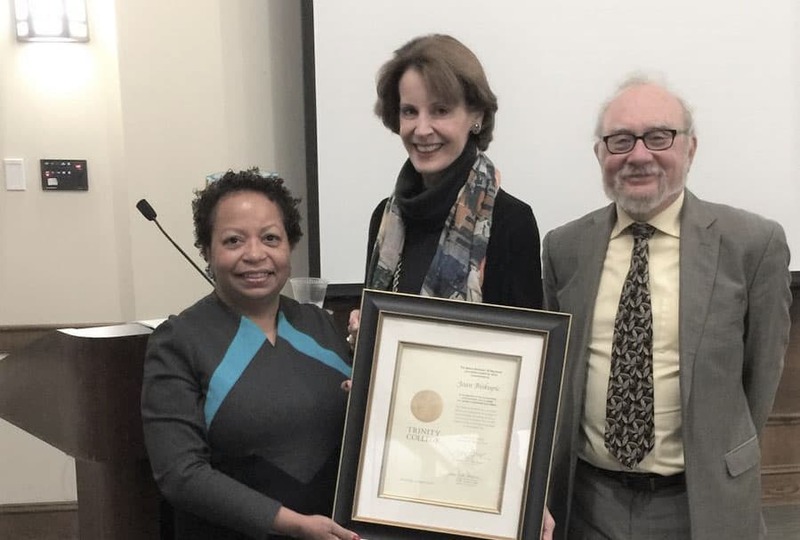 (Left-right) Trinity College President Joanne Berger-Sweeney, CNN legal analyst and author Joan Biskupic, and Professor of Religion in Public Life Mark Silk. Biskupic was at Trinity College on November 15 to receive the 2018 Moses Berkman Memorial Journalism Award. Biskupic is a graduate of the Georgetown University law school and has worked as a visiting law professor at the University of California, Irvine, and as editor-in-charge for legal affairs at Reuters. Prior to joining CNN in 2017, Biskupic was the Supreme Court correspondent for the Washington Post and USA Today. Biskupic noted how Roberts, as the 17th chief justice of the U.S. Supreme Court, has cultivated a certain image. “People deserve to understand this man… Justices aren’t political, they’re ruling on law, not their own experiences,” she said. She was determined to get through to Roberts in order to understand him and the origins of his views. Biskupic talked about how her process of obtaining information is all about discovery and how she did not hold back from asking him all of her questions. Biskupic also mentioned the mutual skepticism and frustration in obtaining information as a biographer. “I felt I came to understand the gap between appearance and reality that exists up there,” she said. The Moses Berkman Memorial Journalism Award is supported by The Moses and Florence Berkman Endowed Fund at Trinity College, in honor of the late Moses Berkman, Class of 1920. Berkman was a journalist who served the Hartford Times as a political correspondent, columnist, and editorial writer from the early 1920s until his death in 1956. The award is given every two years by Trinity’s Program on Public Values.